New Balance Fresh Foam Gobi v2 are neutral trail running shoes. 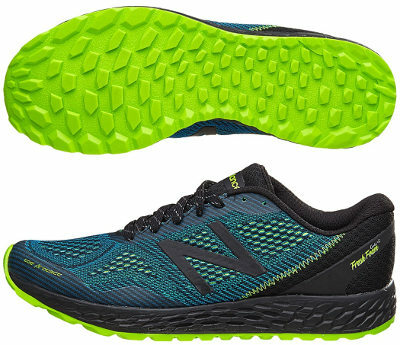 The New Balance Fresh Foam Gobi v2 develops the "light trail" or "door to trail" concept of a shoe which performs well on tracks or dirt paths and also on roads. Plenty of cushioning, it provides a moderate agile response (just 6 mm drop) and high quality materials offering great value for money, actually available at very interesting price. The Fresh Foam Gobi v2 would be a kind of Fresh Foam Zante v3 for offroad running but not as powerful as impressive Fresh Foam Hierro v2. As moderately successful first edition, its predecessor Fresh Foam Gobi got many good reviews although there was always room to improve. As a result of unbiased feedback from independent runners, current second edition is plenty of meaningful changes starting with reinforced upper featuring Toe Protect in the toe cap and seamless multilayer mesh which not only expands in a similar way other fabrics like FlyKnit from Nike or PrimeKnit from Adidas do but also provide improved breathability with increased ventilation. Removable insole made of EVA can be replaced by custom one and gusseted tongue offers extra comfort without folding and prevent dust and debris from jumping inside. Midsole in Gobi v2 is based on latest development of flagship foam from american brand Fresh Foam featuring just 6 mm drop for smooth response. Like in its counterpart for road running Fresh Foam Zante v3, midsole is no longer only made of hexagonal shapes but geometry changes depending on area to optimize both shock absorption and take off stages. Although outsole is not as fantastic as in Fresh Foam Hierro v2, grip on wet surfaces has been improved using "AT TREAD Hydrohesion" rubber and lug pattern has been redesigned to increase traction.